Imagine a young, twenty-something woman in 1860, reared “in the indolent life of the ordinary Southern girl” (which means she has never learned to cook); married to a professional man who knows “nothing of manual labor;” who is mother to a young son; and who has just found out she is pregnant with their second child. Imagine that this couple has become “embarrassed financially” by “imprudent speculations,” and that they are discussing what to do. 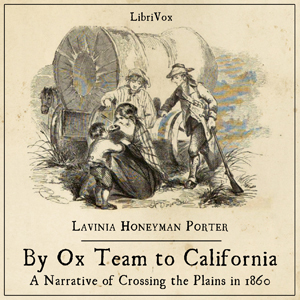 They decide to buy a wagon and three yoke of unbroken oxen and head overland to California. "We were two such precious dunces,” writes Lavinia Honeyman Porter in her autobiographical account of their journey across the plains. “In a short time the six oxen were bought, driven to our home and turned loose in our barnyard--wild brutes, as handy as with their heels as with their horns. Not one of us was brave enough to venture into the corral with them and we soon concluded we had six white elephants on our hands.” From there on in, Lavinia's adventures get worse—and then better. For those who enjoy true stories of pioneering days and happy endings, this is an enjoyable read.